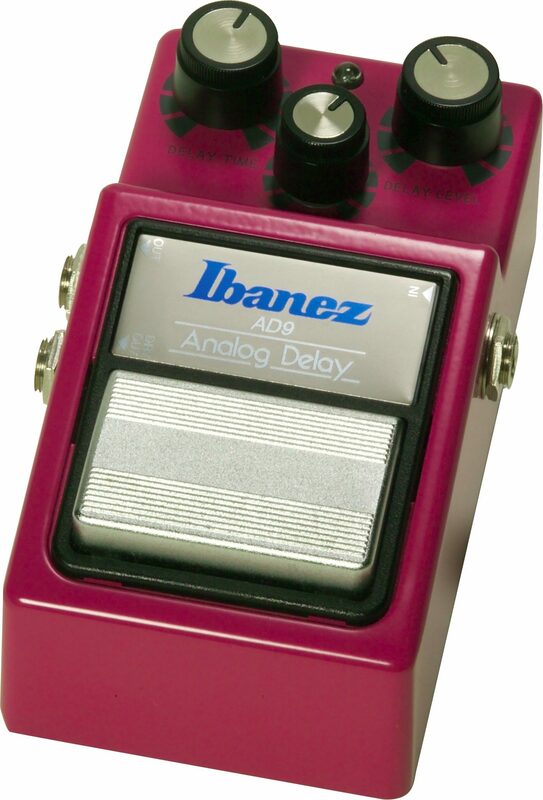 It's been awhile since Ibanez offered the AD9 Analog Day effects pedal. As a matter of fact it's been well over 20 years. But the AD9 is finally back; and once again it's got the warm, thick analog delay you just can't get from a digital device. That kind of sound is why you still see old AD9's in the racks and pedal boards of players. The AD9 features 10-300ms of analog delay, wet and dry outputs. The AD9 joins Ibanez several other Ibanez Nine Series reissues, the TS9 Tube Screamer which was reissued in 1993 and the FL9 Flanger and CS9 Stereo Chorus which were released at the 2004 NAMM Show. The Nine Series was named for the fact that all the pedals in the early '80s line-up required only one nine volt battery (the AD9's immediate ancestor was an 18-volt device requiring two nine-volt batteries), which was quite an advance back in those ancient times. Travel Back In Time... (Here's what Ibanez said about the AD9 back in the Middle Ages): "Discrete echo is one of the most dramatic effects in the music industry. Bulky tape and "spinning disk" units have given way to the convenience and reliability of solid-state delays. The AD9 Analog Delay uses a compander with pre- and de-emphasis for an exceptionally clean delay. The Delay Time control adjusts the delay time and the Delay Level control allows the artist to adjust the mix between dry and delayed signals. The Repeat control permits the number of repeats to be controlled without runaway. Two outputs enable the dry and delayed signals to be separately routed for dramatic special movement. The quality and features of the AD9 Analog Delay make it the professional's choice." -- AD9 description in the 1984 Ibanez Sound Effects catalog. Sound: Dark, creamy, dreamy, perfecto. Blends beautifully. I'm not sure you want anything else really, other than say a Fulltone TTE or a Space Echo. Digital delays are for weeners. Feature: The sound is the main feature. There are trim pots inside but I didn't see any need to touch them. There is a dry out, in which case the dry signal is muted from the (now 100%) wet out. That lets you mix the wet in with the dry later, or split them to different amps or speakers. The wet is dark on this delay, leading some people to freak out about how stereo mode is dark, not at all, it's just the echoes that are dark...durr... Ease of Use: three knobs twist and shout! Quality: They last from the fact they are still in use after 20 years. Value: You can get digital things like Line6 DL4 that claims it can do this but this is the real analog bucket brigade delay and nothing has quite its glow or smear. Plus there's no degradation of the original signal that I can hear (whereas going through AD/DA conversion will). Manufacturer Support: haven't contacted them The Wow Factor: I love it, won't part with it, but haven't heard the higher-end Maxon units. Overall: Simple, does what it's supposed to, knobs can be twisted by foot if desired. Dial in your tone and go, no fussing with ten different buttons and modes. Easier to dial in that recall what preset you want. And the TONE! "This Analog Delay Effect IS the cat's Meow!!" Sound: This has toi be one of the best IF NOT the best Analog Delay Units on the market today. I have heard several Pedal Steel Guitarists use this Delay and I absolutly love the sound that comes from one of these units. I just had to get one! I thinks that these Delays units are AWESOME!! Feature: This Delay is esay to hook up to your Instrument. Nothing difficult about it. Ease of Use: Different Delay sounds from this unit are easy to obtain...Just turn the knobs until you find what sounds best to fit your style. Quality: Nothing to say here except....AWESOME!! Value: The price is not bad either! Manufacturer Support: I haven't had a problem...yet as I have just ordered this unit. BUT from whoat I hear from other people that do have this Delay unit, I do not anticipate any problems with it. The Wow Factor: "I Want IT" just for the sounds that you can get from it!